The London Eye has quickly become an iconic experience for first time visitors to London despite being only 14 years old. This London attraction will give you a 30 minute ride to see the sites of London. It will top out at 443 feet (135 meters) with stunning views of Westminster and Lambeth. The kids are excited to visit. I think this is two fold - it is something they have heard of and it is a Ferris wheel (e.g. it moves). Personally I would rather see London from the View from the Shard. You are higher up and you get to stay until you are ready to leave. One of the most challenging aspects of visiting the London Eye is figuring out which ticket to buy. I find it fascinating that you need a buying guide to select which ticket is best for your Ferris wheel experience. You have to decide if you want to buy online or in person. You have to do this at least 4 days in advanced, but it saves money. Then you have to decide if you want a standard or fast track ticket. The fast track allows you to go to the front of the line - kind of like Disney's fast pass. Next you have to decide to buy the flexi option. This allows you to visit without having to preselect an arrival time. One of the reasons for the complexity of ticket prices is the weather. No one really want to sight-see in the middle of a rain cloud. The cheapest option is to buy a standard ticket online 4 days in advance. This will tie you to a day and a specific time - rain or shine. Flexi options allow you to either select a day within the week or a time with a specified day. The fast track sound appealing but with a capacity of 1,600 people per hour, it isn't always needed. The line moves pretty quick. 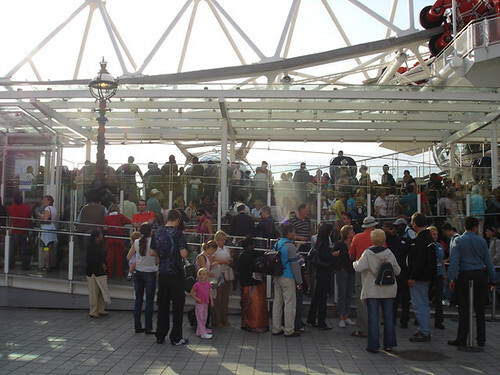 London Eye is at its busiest during the months of July and August. In the off season the Eye opens at 10:00 AM and goes until 8:30 at night. The busiest time of the day would be from 11:00 am to 3:00 pm. 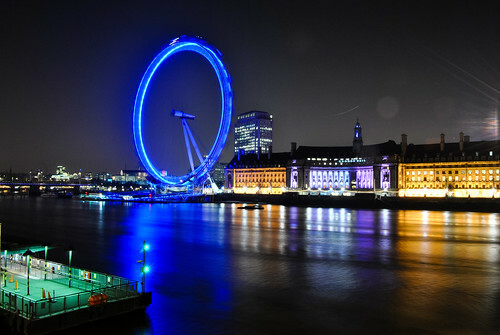 A video from London Landmarks highlights the London Eye. Apart from buying online there isn't a lot of discounts. You can get a family pass that will cover a family of four. There is no help from the London Pass on this one. If you buy online you print off your tickets at home and go straight to the boarding lines. If you are buying on site the ticket office is located inside County Hall, which is the building directly next to the London Eye. Bathrooms are also located in the County Hall building. Since you may be in line for 20 minutes and there are no bathrooms on board the 30 minute ride you may want to hit the facilities before starting. 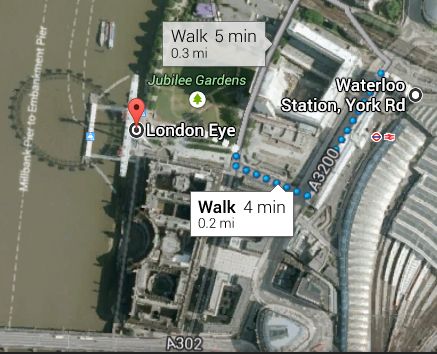 The closest London Tube station is Waterloo. When you exit follow the signs for South Bank. You can also arrive via Riverboat at the Millenium Pier or if your kids are older consider using Barclays Cycle Hire bicycles.